OK, You have read some of my articles on my Retro-Winnie. If you haven’t, let me explain. My wife and I got out of camping a couple of years ago, due to health issues. We dumped our Big Rig, and moved on, concentrating on our health and getting better. Then, a year ago, our love of camping drove us to purchase an older unit so we could at least camp occasionally. Well, the camping bug hit us hard, and our 2001 Winnebago suited us just fine. It looked terrible on the outside with the flaking decals, but it was in great shape inside. Then, a month ago, we found a good deal on a newer used RV, and of course, we traded up. 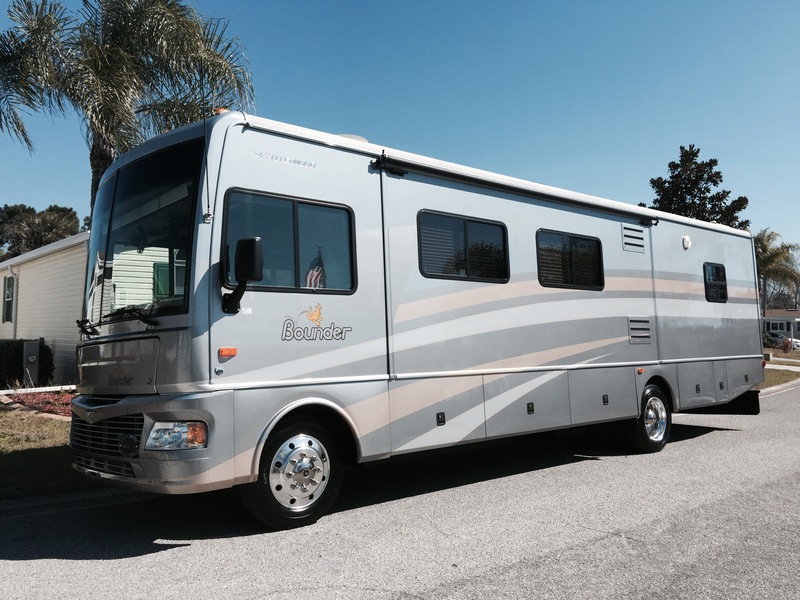 So, we now have 2006 Fleetwood Bounder. It’s the same length and the layout fits us fine. But, at first we were only going to hop around Florida and we would just take our car with us on the road. I would drive one and my wife would drive the other. That was fine, but, again, we have the camping bug and want to go a little further on some of our camping trips. bUt, of course, our automobile needs have now changed. For those longer trips, we really need a Tow Car. The problem is, we have a car that cannot be towed either 4-down or with a Tow Dolly. That only leaves using a Car Hauler trailer to transport our car. But, you see, we are too old (and lame, LOL!) to deal with crawling around Car Hauler trailers, (or even Tow Dollies if the worked for us) loading and strapping down a car. So that leaves us in need of a TOAD. We have started looking for a cheap Car, that is already set up for 4-down towing, and I do mean cheap. And, yes, we do need a car. We don’t just sit and camp, rather, we camp and explore. That’s our RV lifestyle. So, we have started the search for a TOAD. It should be interesting what we fin out there that might fit our needs. As a reader, you are welcome to enjoy and share this article with friends. But, if you wish to use it commercially, you must have the written permission of the author.